After a college career across the country and a start to his first full pro season nearly 2,000 miles away from where he grew up, Aaron Blair finally had a little taste of home in his California League debut. The D-backs' No. 3 prospect dazzled in front of friends and family at his new home ballpark, striking out nine and allowing just one run on three hits and two walks while striking out nine over seven frames, but Class A Advanced Visalia fell to Stockton, 6-2. The son of two Fresno natives, Blair counted his parents, aunts, uncles and grandparents among those in the stands at Recreation Park on Thursday night, and the right-hander didn't waste time settling into his new surroundings. In the hitter-friendly Cal League, last year's 36th overall pick cruised early in his outing, retiring the side in order in the first and pitching around a two-out walk in the second. "Anywhere you're playing, you've just got to keep the ball down and throw your pitches for strikes," Blair said. "I was able to do that today and get ground balls, work hitters the way I wanted. I had all my pitches working." A leadoff homer by Wade Kirkland in the third inning didn't faze the Marshall University product, although Blair also gave up a two-out single to No. 2 A's prospect Billy McKinney in the third. A fifth-inning plunking of Kirkland presented no issue, nor did a single by Oakland's No. 5 prospect Matt Olson and an ensuing walk to Ryan Healy in the sixth. "Every start's the same. You just want to throw strikes," said Blair, who went 1-2 with a 4.04 ERA in six starts for Class A South Bend to begin the year. "I was able to watch two games prior to pitching [tonight] and learn a little bit about the [Stockton] hitters, their tendencies. I just took that out on the mound." Blair exited in line for the win after a two-run homer by Brandon Jacobs homer in the second. The 21-year-old set down the Ports in order in the seventh, punctuating his night with a strikeout of Ryan Gorton. "It's also helpful being with a lot of older guys, some guys that have been through the Cal League," he said. "They give you hints here and there. The big thing is to keep the ball down because it is a hitters' league. If you make your pitches, some guys will hit them, but most of the time, you're going to get outs." 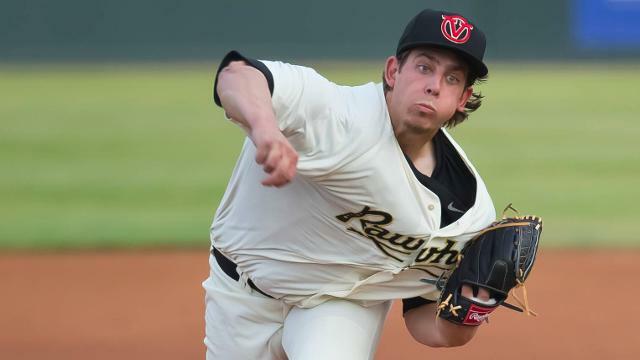 After Blair's departure, the Rawhide bullpen faltered. Seth Simmons gave up back-to-back homers to No. 6 A's prospect Renato Nunez and Olson in the eighth. Stockton padded its leads with RBI singles by Nunez and Healy in the ninth. Simmons (1-2) was charged with three runs -- all earned -- on five hits and a walk in two-thirds of an inning. Ports reliever Kris Hall (2-0) earned the win. He struck out five while walking two in two hitless innings.